You can find reviews of the actual stories in lots of other places, but what distracted me today was thinking about the overall concept of the project and why I think it's probably going to fail. The main problem I have with the experiment is that they're basically taking long stories and putting them out one page at a time. That works when the primary content delivery system is also serial -- i.e. newspapers that print in color only once a week. But the reason you don't have very many of those strips any more is because longer stories work better as one block rather than a series of one-page blocks a week apart. Just as novels eventually moved away from being serialized in magazines in favor of the more cohesive between-the-covers book format, people prefer to get their entire story all at once rather than having to ration it out. The introduction and popularity of trade paper-backs has only exacerbated this evolution. In a real sense, the monthly comic book was the heir to the Sunday strips, giving the reader much more story in one package rather than stringing the same story out in four installments. Now for people like me, who don't have the patience or discipline to wait four weeks between issues, I can get the entire meta-story all at one sitting. It's like moving from short stories to serial novels in papers to the novel itself to trilogies to the all-in-one comprehensive all-three-novels-collected-in-one edition. So in a world with TPBs and monthly comics, a weekly set of comics dribbled out one page at a time is just too slow, and too choppy, for a modern audience to really get behind. I think the storytelling -- which for me is the most important thing -- also suffers. You have to spend a panel or two either explaining what went before or what's about to happen, and that's just wasted space. Just like modern comics moved from taking a couple of pages and endless "editor's notes" to keep the reader informed about past issues to sometimes nothing more than a brief paragraph on the inside cover -- if that -- having to keep up the effort to engage a new reader appearing mid-stream distracts from the story itself. A much more interesting experiment would have been to have the same physical format and the same schedule, but instead of serializing the stories, make them all true one-page comics, where every story is complete into itself on that one page. That would be different, fun, and interesting. Call it the Twittering of comics, the introduction of a very short time constraint in an attempt to distill the story down to its essence. But as it stands, I just don't see getting behind something that requires you to go in every week only to get a small taste of a much larger story, told in a way that distracts rather than adds to the experience. And even for Distracticons, that's a bad thing. You knew I was gonna say that. Yeah, I’ve been thinking of a HM3 Comic for a while, never got ’round to it. They said at the ComicCon last weekend that they were going to put all the Wed Weeky together to make a big book later on. Just because it’s not going to be as popular as the regular sort, doesn’t mean it’s going to be a Failure! I’m more troubled that roughly half the ‘book’ is pure and absolute garbage (especially “Hawkman” and “Wonder Woman”! ), and by the prospect that DC will blame the format, when the blame lies with the poor quality of the product! I just ordered one for the heck of it. If anybody’s interested, I’ll let you know when it arrives, and maybe put a review up on my blog. I like it as an experiment too, and give them full thumbs up for trying to innovate. I agree that some of the stories are just not very good so far, although I like Hawkman probably the best out of all of them. Which is good, I think, people have enough there that what one person doesn’t like another will. I suppose really what they have here is a weekly short story anthology. Which isn’t really my cup of tea but I can certainly see how it would be for others. I think the main source of my skepticism that it’ll “work” is like I said, you’ve got long serial stories basically being released one page at a time, which I think is sort of betwixt-and-between the long form on one hand (i.e. TPBs or just regular monthly comics) and true “short” comics on the other (i.e. one page complete stories). It could work, sure, and I bet some of the stories will be great and some will flop. But as you say, that’s more on the stories themselves rather than the format. My concerns on FORMAT are sort of to the side of the actual content (art and writing both) of the stories themselves. There is a reason why its called “an experiment”, Jeff. Personally, the experiment has its good qualities. I grew up reading the Sunday comics and comic strips and DC’s Wednesday strip is a nice breath of fresh air. It has some top notch strips. The Batman and Superman strips are very good but there are some dark horses that grab my attention even more so. Kamandi is one of them. I love the Prince Valliant approach to the story telling and it doesn’t let down on the action. Another winner in my book is Metamorpho. The tag team of Gailman and Allerd just works as they bring back the silver age quality of this great character and his cast. GL is a winner since it goes with its silver age/space age roots and runs with it. Flash is a two part winner since it tells the story of Iris West (ala a Mary Worth/ Rex Morgan M.D. sort of way of story telling) and the scarlet speedster himself. Also, Hawkman, Sargent Rock, Deadman, Supergirl, and Strange Adventures (Adam Strange’s comic) rock out in their own way. The few flaws in this is the Wonder Woman strip. Too many panels trying to cram so much story in one shot imo. Also, Teen Titans is great but the artist is rather lacking. Mt biggest beef is the 3.99 price tag. They say its due to the great artwork and story-telling but I still believe this would work better if they lowered the price somewhere between a 1.50-2.00 price tag. Also, this comic should be offered in mainstream stores like Borders and perhaps newsstands. Hell, if DC can make some deals with some newspapers (like they did with USA Today) these comic strips can be seen by new readers all around. 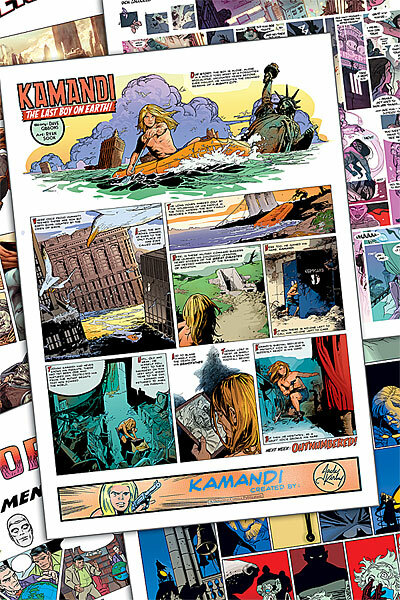 It would be nice to open up a Chicago Tribune and see the adventures of Kamandi and Metamorpho. I do hope they find success in this experiment. It has so much potential to reach new people if done right. Plus there are many other DC characters that could shine in these strips. Until then, I await Wednesday with anticipation. @Mr. Q: I’m all for experiments, and I actually hope this one turns out well. As I said, I like a number of the stories. I just don’t think, overall, that serial larger-arc stories told one page at a time in tabloid sized comics on newsprint are going to fly, long-term, for the reasons I said. I hope I’m wrong because I’m for anything that expands the reach and increases the success of comics. I just doubt it, that’s all.